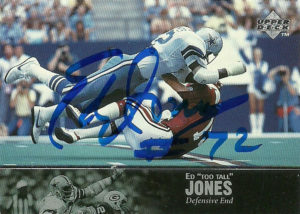 Ed Too Tall Jones was my favorite Cowboy player on defense as a kid, so after getting him all those years ago in person, I thought that I might nab him on these other cards I had. I got the Topps 84 through a friend who was liquidating his collection in 2012. Then later in 2014, I had intended to attend an event with him at it in Dallas, but two days before leaving I got very sick, so I had to call it off. Right afterwards I sent off for him TTM, but it must have been a sacrifice to the mail gods, as the highly reliable Jones did not respond. I gave him another shot in 2016 and I was pretty happy with the response, with him signing the ProSet, Score, and Upper Deck entries. Ed has gotten around over the past few years. The surprisingly durable Jones has made appearances in a few movies- most recently The Wedding Ringer wearing his iconic #72. He also was elected to the Black College Football Hall of Fame in 2015 after leaving Tennessee State second on the school’s all time list with 106 sacks. He was also recognized as the player of honor at the 17th Annual John Merritt Classic game against Alabama State that year as well. He is an avid golfer and makes appearances at many celebrity tournaments outside the Dallas area. 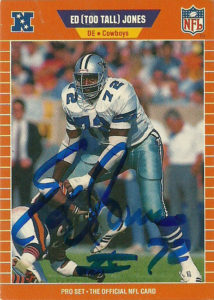 Despite Jones’ strong pro football resume, he played during an era when sacks and tackles were not tracked/ did not count, and with the backlog of defensive players AND over abundance of Cowboys nominated every year, he has not been enshrined in the HoF. 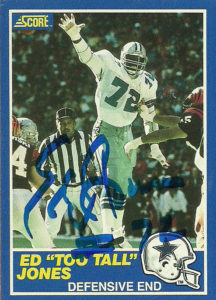 Recently a fan petition through change.org did receive some traction attempting to get him inducted at least into the Cowboys Ring of Honor- something that seems long overdue for the iconic Too Tall Jones at least not be in. The venerable Bruce Armstrong really nailed down the right/ left tackle positions for New England throughout the late 80s and into the 1990s, so much so that he was nominated for the NFL HoF in 2011, and the Patriot organization retired his number. Armstrong over his storied career played in a franchise high 212 games. Amazingly enough he started as a tight end at Louisville, before switching over to tackle as a Senior- where he allowed zero sacks. 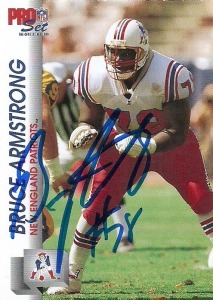 Armstrong had it all over his career with the Patriots, combining speed, power, and durability, making him a formidable pass and run blocker. 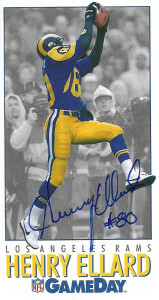 Merv Corning’s work on the Pro Set Superbowl cards were not enough, so the company had him come back to create the All Pro subset in 1991. 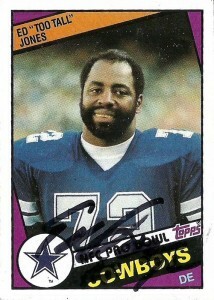 He also chipped in some spot work on ProLine as well. 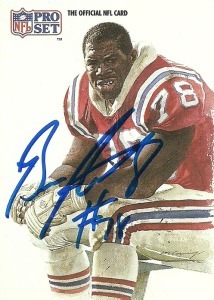 While I was never a fan of ProSet 1992’s break in style between the two series that year, they still had some pretty good photos littering the set and this card with the red pants is a really nice throwback issue the Patriots briefly did. A solid signer, the venerable Armstrong boasts a 90% response rate (250+ attempts) through 2015.